It’s the right time of year to be enjoying a light catcher or two (I have many more than two) with the sun laying low in the sky and sunbeams more inclined to come through windows and play with the faceted crystals. 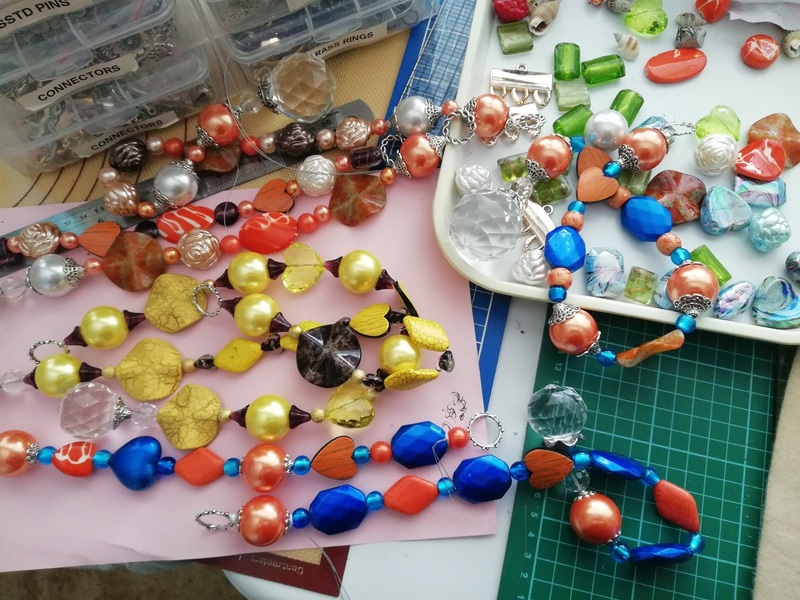 I had started playing with, for me, unusual colour combinations of beads – you may recall seeing this photo a couple of posts back Eventually I completed three – at some stage I’ll pop them into my shop. This first one I feel I was channeling my late friend Cynthia who loved bold hues of orange and blue and I pretty much smiled and even laughed out loud on my way through its creation. So, of course, this is called The Cynthia. Next this one came, I’m thinking ‘Chocolate and Lemon Cream’ …….. Mmmmmmm! The deep brown fluted beads look black here – but that is just my terrible photography. It really looks good enough to eat – but please don’t Siddy! I also made a pink catcher, but as you can’t eat that one, I’ll just pop it quietly into the shop. Next lot will probably all be shades of blue just to make me really happy. The Seaside Stash Busting Blanket is up to date with the CAL. Here is the link if you are interested in checking it out. It’s not too late as Eleonora adds just four or six rows a week and we are, I think, at week 13 now. My two rows of pebbles tend to look a bit ruffled here – perhaps its the wind that is howling around outside the house. I’m thinking I might steam it and stretch it out a bit so that all the bobbles and interesting bits find their places nicely…….. Or I might just leave it. Any thoughts? I think this is the last time I’ll be able to show all the rows all at once – it’s starting to get quite big. Still, with the weather showing definite signs that winter is approaching fast it is nice to have this across my knee as I hook away. So with those catchers completed, it’s back to the card making. Happy days! This entry was posted in Creations From My Craft Room and tagged light-catchers, stash busting CAL by thecontentedcrafter. Bookmark the permalink. You are so talented, sun catchers can brighten even the worst of days. I love your blanket stitching , it is so pretty. I will mark the link post because for me it is starting to warm up to get ready for summer. I would love to try it come fall. Thank you for sharing. I can’t tell you how much I love mine! Every day I have vibrant rainbows all over the living room! What beautiful light catchers, Pauline. I love The Cynthia. We do still have Jaffas over here, as well as Choc Oranges. I wonder why you don’t. Interesting. I’m sorry I’ve missed many of your posts. I’ll get to them as I can. I must say that, with the sun sparkles, you brightened my day. Thank you. Hello Norah – life can interfere with our blogging visits can’t it 🙂 Luckily there’s nothing life changing on my blog, so missing posts doesn’t really matter. It’s lovely to catch up when we can. Hi, Pauline; I’ve dropped by at times in an effort to catch up, but have not commented for a while. Just too much going on here. But I have to tell you I love your latest creations. I was puzzled that the pink light catcher didn’t receive a ‘tasty’ name; I immediately thought of strawberries and other such things, as well as the delicious pink apple pies my cousin S has been making since I came to stay with them. She doesn’t use any sugar, just adds a quarter cup (I think) of those wee cinnamon candy hearts. Pink lemonade came to mind, as well. Anyway . . .
That Persian Tile pattern is gorgeous! I don’t know if you remember, but back around 2013-2014 I crocheted quite a few blankets while chatting with my Auntie Irene in Edmonton. Those were all ‘sampler’ patterns, as I had joined a face-to-face crocheting group in England that was run by Selma of Eclectic Home and Life. She taught a different pattern each week and we did as many rows as we wished. I really like sampler blankets; one can use colour to harmonise them. I like how yours is turning out. I’m tempted to say yes, block and steam it. If you don’t press it, the textures should only be enhanced. If you’re not sure, maybe try steaming just a bit of it and see what you think. Or a sample that’s similar, assuming you have time to make one. I don’t think I’ve heard of the chocolate-orange Jaffas; we only have the chocolate ‘oranges’ that break into slices here. I agree that it was a tremendous waste to roll them down the aisles. Didn’t anyone try to collect some afterward? I’m sure I would have wanted to. I hope your winter is not too long; it doesn’t sound promising that you already have cold. We are only just beginning spring here; I saw my first daffodils a few days ago in Vernon, which is lower than Salmon Arm, also drier and a bit warmer. One last thing . . . we have a small town here named Hope; if you ever wish to live in Hope, I can give you directions . . . 🙂 We here like to say that we are beyond Hope . . .
(I changed my username for the new blogs and it is showing up everywhere, but I’m leaving it for now. Bestemor is what my grandchildren call me; Grandmother in Norwegian). And four, you are just lovely! 🙂 ❤ Thank you Pam, you made me smile! What a wonderful way to keep alive the memory of Cynthia. Are you most creative in the fall? It sure looks like it! That’s a question I have never asked myself – it could just be proximity of time and season or there could be something in that thought. Must pay closer attention…….. Yes we do need those people in our lives to be complete. Under the circumstances, I’ve learned what is really important. I love making for everyone but still want to spend time with them and nothing else is more important. Everyday is a gift. So lovely to hear Cynthia remembered. I still miss her. She was a strong presence wasn’t she, I think of her often. Such a lot of creation going on. I like all your color combinations, though that golden one (chocolate and lemon) makes me think Hawaii, for some reason. And your blanket!!! it looks beautiful and warm and weighty. And fabulous colors of course–like all of nature in a blanket. Now for the cards, eh? Stay warm. Hawaii! An excellent place for a mid-winter break. I once had a teaching colleague, a bachelor, who took himself off for a week to Hawaii every winter. He always returned tanned and rested and the rest of us, raising families, were quite miffed 🙂 I returned to the card today, but it always takes a while to work myself back in – so not a lot was achieved. Ha – while you were having dessert, I was opening a package with the able assistance of Sir Siddy who was quite convinced there was something very tasty in there 🙂 There was, but not for him 🙂 An email will follow. After I made the lemon chocolate dangler I had some ice cream with lemon curd spooned on top and a bit of yoghurt poured over – it was yummy despite the lack of chocolate! Thank you Cheryl, you always leave a comment that makes me happy! What surprisingly lovely colour combinations in those light catchers. If you had just described them I maybe wouldn’t have been convinced, but they look delightful. I’m sure they’ll be snapped up from your shop pretty quickly. I love your color choices for the sun-catchers, Pauline. Especially the ones that look good enough to eat! Ha ha. And the blanket is wonderful. I love the variety of colors and designs. It’s so playful! Have fun with your creative projects! Your light catchers: beautiful every one! How I wish that the transport cost from New Zealand to the US wasn’t so prohibitive for me. Yes, I’m sorry about that Rosaliene – it keeps going up as well! They are a pricey bit of frippery really……. No, that is not what we had – and I am most intrigued! Anything tasting of chocolate and orange – or lemon – or peppermint – gets my vote! Lovely post, Pauline. You do beautiful work. What wonderful light catchers! I love that you named one as a tribute to Cynthia. This is who you are: kind, thoughtful and open-hearted. I love the blanket. I like the way it looks without the steaming. It has a nice texture. Orlando and Siddy are such a riot! Yarn Rascal does the same thing. Has to be draped over my lap while I am knitting which means I have to hold the knitting up in the air to accomplish anything. I never thought about it that way. But yes, I can see how that will get the muscles in shape! It doesn’t seem right that you have winter and we do, too! Aren’t we supposed to get summer when you get winter? It’s horrible here . . . but I still catch sunbeams with my light catcher (and I’m glad it’s blue!) I like your new color combinations–see, you’ve been encouraging me to try new things and it’s worked for you, too! The chocolate lemon cream really caught my eye, it’s beautiful. As is the blanket. What a lovely childhood memory. For me it was milk duds – they totally destroy your teeth, but it was worth it. Sorry you are already seeing Winter, that must have been a very short Autumn. I like that one too – it looks so lovely hanging up! I’ve heard of milk duds of course, but have no clue what they are – probably just as well if they did that to your teeth 🙂 It was indeed a short autumn! As far as I know, we still call those lollies Jaffas – why was the name changed over there? I always thought rolling them down the aisle was a dreadful waste of chocolate. Your light catchers are gorgeous and I particularly like the chocolate orange one. I can’t believe it’s got so cold so early. Here it is still very summery, with temperatures in the mid to high 20s. This morning I am hopeful of a reprieve in winters arrival – the wind has died away and the temperature has risen….. I live in hope! But it does rather seem as if we are in for a long and turbulent season, so I am glad to have my two woolly projects underway! To the best of my knowledge the name change was occasioned by the perjorative use of the word to describe people of colour from another land (though it’s also a tongue in cheek term the rest of the country uses to describe metro Aucklanders – it’s an acronym) The deep dim recesses of my memory wonder if there may also be another company producing the same sweet that initiated the name change. I thought it was a dreadful waste of tastiness too, clattering them down the floor boards – but we never had them as kids and could only watch on enviously……. I wondered if that might be the reason, not that I’ve ever heard the word used in any other way here. What a shame. Let’s hope you get some warmer weather soon. It’s another glorious day here. It warmed up today – a delightful turn around! I hope it lingers for a few more days. Hasn’t it been a lovely day – a real treat! Lovely work, Pauline. Good to see more combinations in light catchers. As you know, ours throws rainbows round our kitchen. I would leave the pebbles – for texture. Also liked the mention of Cynthia, who still comes up time and again. I love knowing there are sparkles all round the world from my light catchers Derrick 🙂 Cynthia is still much loved by so many. It’s lovely to bear witness to that isn’t it! And I appreciate hearing your thoughts on the pebbles, thank you! How lovely to see the tribute to Cynthia. I don’t know about you, but I think of her often, she made quite an impact on may people. I wish she had known how well loved she was Yvonne! I do often think of her, she steals into my thoughts with a pithy addition quite often! She loved that colour combination and I found myself well underway with it before realising there she was again! Cool huh!! You have such an amazing eye for colour. I would never have thought to put blue with orange and it works so incredibly well. The blanket looks so good. I would never have put blue and orange together either Cathy, it was always my friends idea! And it does look great doesn’t it – so vibrant and cheerful! Oh…are the two rows of pebbles you reference the rows at the top (our top)? I’ve seen blankets with lots of texture and I like the look. Is this something you can add a few more rows to before deciding? Yes, that is correct. It’s (again) fairly straight forward and easily made (and removed) and added to. I was thinking this is a really great way of learning lots of different stitches – you could make it up like a crochet primer…. Did I pass this idea onto you already? I was thinking that, too, Pauline – that it would be a great way to learn new stitches! You’ve given me a lot to think about, Pauline. I just need to get through the next eight weeks and I’ll be able to “breathe” again. Between now and then we’ll be attending my nephew’s college graduation, M’s high school graduation, Mike and the boy’s birthdays, all in May and early June, and two more college tours. I’m half way through my 30-day outdoor makeover, thwarted by late-season rain and a busy schedule. A video crochet-along sounds like great fun. I think Cynthia would be delighted to know you named a light catcher after her. It feels bitter sweet. It must have been special working on that one, Pauline. You are a woman of so many talents: cards, light-catchers, crochet and you move between each one with what appears to be little effort. It sounds like winter is settling in without any consideration for autumn first. Is it typically that cold and windy in mid-April? We’re still in Reno, and although it’s 70F outside, there is still snow on the nearby mountains. Weird! Are they forecasting a cold winter for you? Sending you a warm hug, along with an extra little pat for Siddy and an ear scratch for O (if he likes that sort of thing). Hello again Alys – I was just visiting you! The truth is my hands need to be busy and I love making things. I’ve made things all my life and don’t really know how to stop. I’d probably take up drinking if I couldn’t create! 😀 (I suspect creating is more affordable.) Autumn was pretty brief really and then rather abruptly the cold and wet started and now we have the wind as well. The heating is on. It does feel a bit early, but then again the country seems to have been battered by storms continuously through the summer and maybe that trend will continue. We are still becoming acquainted with the new ‘normal’. The boys are both beside me while I write this, waiting for the keyboard to move from my knee so they can tussle over who gets to sit/lie on it. This means I get to crochet with the project held up under my nose and my neck pushed up and back – no movie for me tonight 🙂 All scratches and tickles happily accepted by O of course and Siddy doesn’t mind them either. I’m smiling at the scene you’ve painted here, Pauline, with your crocheting up around your face while O and S jockey for position. It’s stunning to me that you’ve had so many storms this year, but as you say, the new normal is anything but predictable. On Monday here in San Jose, we had thunder (unheard of in this valley) followed by hail (hail in April…also unheard of) and by 10 a 3.9 earthquake on a nearby fault. What a surreal day. Your wind sounds scary, especially when it’s powerful enough to bring down a limb of an oak tree. I’m glad there are no large trees close to your abode. Discussions about the weather have moved from the mundane to the profound 🙂 And yes, your Monday morning occurrences do sound close to surreal! Thank heavens the quake was a small shake. I am often sad about the lack of trees around my place, but now you have made that statement I realise it should be something I am pleased about 🙂 There’s always an upside! There is always an upside. And remember, you now have a maple tree growing on your patio. It will be taller than the fence in no time (unless it’s a dwarf variety). Yes, mundane to profound is a good way to describe it. At this stage, typical weather means nothing any more.